The Saudi education system has been experiencing continuous reforms during the past two decades. However, despite the financial support education reforms are granted by the government, impact of those reforms on education outcomes, if any, remains minimal. The author argues that reviewing Saudi education reforms based on Rogers’ (2003) characteristics of innovation (internal factors) and Ely’s (1990, 1999) conditions of change (external factors) as a framework demonstrates that shortcomings of these reforms could be attributed to a lack or at best to weak change management and leadership that failed to provide for those factors during the implementation stage. Taking these factors into consideration by Educational Administration Departments at the Colleges of Education in Saudi universities should improve teaching topics and issues of educational administration and leadership at these departments as well as improving school’s principals in their role as change managers. 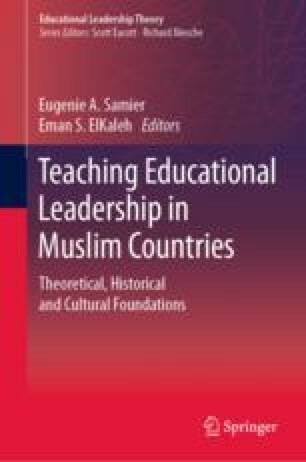 This chapter starts with an overview of the Saudi education system and the Tatweer education reform project followed by an overview of Rogers (2003) and Ely’s (1990, 1999) proposed frameworks. Next, it critically reviews Saudi education reforms based on this framework. The chapter ends with proposed curriculum outlines in change management and leadership for the preparation of future graduates of the colleges of education at Saudi universities. Ely, D. P. (1999). New perspectives on the implementation of educational technology innovations. https://files.eric.ed.gov/fulltext/ED427775.pdf. Accessed May 15, 2018. Hinde, E. R. (2014). School culture and change: An examination of the effects of school culture on the process of change. https://www.researchgate.net/publication/251297989_School_Culture_and_Change_An_Examination_of_the_Effects_of_School_Culture_on_the_Process_of_Change. Accessed May 25, 2018. Kleiman, G. M. (2000). Myths and realities about technology in K-12 schools. The Online Journal of Leadership and the New Technologies Community, 14. https://ncdli.fi.ncsu.edu/resources/docs/myths_realities_kleiman.pdf. Accessed June 28, 2018. Kotter, J. P. (1995). Leading change: Why transformation efforts fail? Harvard Business Review, March/April 1–8. http://eoeleadership.hee.nhs.uk/sites/default/files/leading_change-why-trtansformation-efforts-fail.pdf. Accessed July 6, 2018. Ladner, M., & Brouillette, M. J. (2000). The impact of limited school choice on public school districts. A Mackinack Center Report. https://www.miworkerfreedomorg/archives/2000/s2000-04.pdf. Accessed June 11, 2018. Maroun, N., Samman, H., Mouzas. C. N., & Abouchakra, R. (2007). How to succeed at education reform: The case for Saudi Arabia and the broader GCC region. 1–36. Booz & Company Ideation Centre analysis. http://citeseerx.ist.psu.edu/viewdoc/download?doi=10.1.1.585.515&rep=rep1&type=pdf. Accessed June 13, 2018. Meemar, S. S. (2014). Tatweer school principals’ perceptions of new authorities granted in the initial steps of decentralization. Western Michigan University. http://scholarworks.wmich.edu/dissertations/384. Accessed May 22, 2018. Microsoft Corporation. (2014). Education transformation framework overview. www.microsoft.com/education/. Accessed June 20, 2018. Pennington, R. (2017). Saudi plans major overhaul to poorly performing education system. Yidan Prize Summit Hong Kong. https://www.thenational.ae/uae/saudi-plans-major-overhaul-to-poorly-performing-education-system-1.683557. Accessed June 23, 2018. Ministry of Education. (2018). Preschool development program (2018). https://kids.tatweer.edu.sa/ in Arabic. Accessed April 25, 2018. Pont, B., Nusche, D., & Moorman, H. (2008). Improving school leadership. Organization for Economic Co-operation and Development (OECD), vol. 1 (Policy and Practice). http://www.oecd.org/education/school/44374889.pdf. Accessed May 16, 2018. Sack, R., Jalloun, O., Zaman, H., & Alenazi, B. (2016). Merging education ministries: Lessons learned from international practices. UNESCO http://unesdoc.unesco.org/images/0024/002473/247344m.pdf. Accessed June 22, 2018. Technical and Vocational Training Corporation. (2017). http://www.tvtc.gov.sa/English/TrainingUnits/Pages/default.aspx. Accessed on March 26, 2018. The Boston Consulting Group. (2018). New blueprint for education in Saudi Arabia. https://www.bcg.com/industries/education/new-blueprint-for-education-in-saudi-arabia.aspx. Accessed April 25, 2018. The Ministry of Education. (2018a). Education annual report for the year 2016–2017. https://drive.google.com/file/d/1Dms201KlLTuthlkK7lpFEYCNH1G99lKE/view. Accessed July 26, 2018. The Ministry of Education. (2018b). Education and vision 2030. https://www.moe.gov.sa/en/Pages/vision2030.aspx. Accessed April 12, 2018. The Ministry of Education. (2017). Building leadership for change through school immersion (Cohort 2). https://www.britishcouncil.org/sites/default/files/rfp-building_educational_leadership_for_change_cohort_2_final.pdf. Accessed April 13, 2018. The National Transformation Program. (2016). http://vision2030.gov.sa/sites/default/files/NTP_En.pdf. Accessed April 23, 2018. The Saudi Vision 2030. http://vision2030.gov.sa/sites/default/files/report/Saudi_Vision2030_EN_2017.pdf. Accessed April 23, 2018. University College of the Cayman Islands. (2013). The changing nature of educational leadership. Journal of the University College of the Cayman Islands, 6. http://www.ucci.edu.ky/_docs/jucci/JUCCI-Issue-6_Dec-2012.pdf. Accessed May 16, 2018.